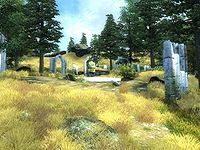 Niryastare is a medium-sized Ayleid ruin northwest of Kvatch containing undead. It contains two zones: Niryastare and Niryastare Silaseli. This location also appears in Blades. 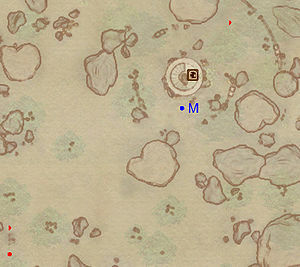 This location's map marker (M on map) is named Niryastare (editor name NiryastareMapMarker). The entrance door is NNE of the marker, 40 feet away. Upon entering, head down the stairs and turn left to minimise the chance of an enemy in the corridor above detecting you. The next room is one large gas chamber (T) and there is a minor loot chest in the southern corner. Press on and you will come across two enemies guarding another chest. Head back to the gas chamber and take door D to Silaseli. 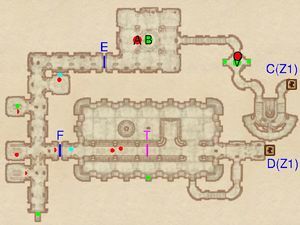 When returning from Silaseli through door C, make your way through the winding corridors, fighting two enemies and looting as many chests along the way. In the first room you come across are 4 Welkynd Stones on easily-accessible pedestals. Unlock the gate at E and slay the enemy guarding two nearby chests before heading out. When entering from door D you will find yourself on a bridge overlooking a large room. There are two enemies at the end of the bridge and you must negotiate the Spiked Barrier trap at T before you can reach them. Use the small area halfway across, on the left, to avoid it as it comes your way. Once you've dispatched the undead, jump down and loot a chest in an alcove in the southern wall. The gate at F is opened by the press plate in front of it. Be wary as you may face up to three enemies in confined quarters. Head south to loot a chest and then north, where in an alcove to your left you will find another chest and a potential enemy. 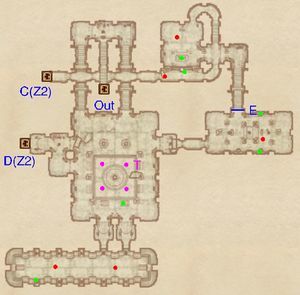 To your right is an alcove with a press block (cyan dot on map) guarded by another undead. This opens the gate at E, which leads to the boss-level undead (A) and boss chest (B). 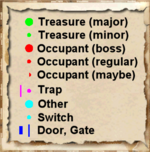 In the final, small room you may chance upon an Orc Adventurer (O) alongside two chests and a Varla stone (V). Head back to the first zone through door C.
This page was last modified on 31 March 2019, at 00:51.